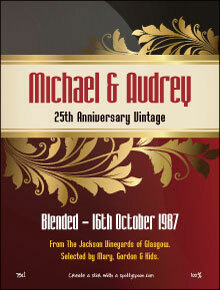 Anniversary Wine Label with a Personal Message. Perfect for the couple who have everything. 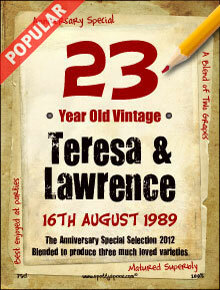 For married couples celebrating their 10th, 20th, 25th, 30th or 40th wedding anniversary this makes a unusual gift. 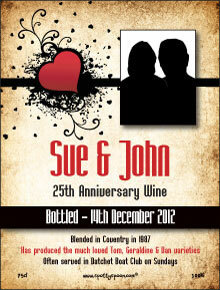 Ideal for the husband and wife who have everything, this wine label turns a plain wine bottle into a very personal gift idea. 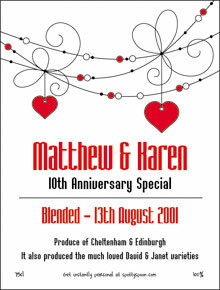 Add the spouses names, the date of the wedding, children's names etc. You can even include the bride's maiden name. Fun phrases to add to the label are 'A Fruity Pairing', 'An Ever Reliable Choice', 'From The (Husband's surname) & (Wife's Maiden Name) Vineyards, 'A blend of two very popular grape varieties' etc.